Election 2012: Where do the Candidates Stand on Foreign Aid? Paul Ryan’s addition to the Romney ticket catapults the election season forward. It also provides a bit more clarity on what a Romney presidency may look like. While other reports will focus on Ryan’s affinity for Ayn Rand, P90X and the impact of his proposed budget on jobs and US economy, I am interested on what his arrival has to say about the Romney team’s plan for foreign aid. I will try to take the information provided by statements and actions of each of the candidates to provide a comparison for the two on the foreign aid budget and programs. In a Google+ Hangout that was done in conjunction with the State of the Union address this year, President Obama fielded a series of questions from people participating and via YouTube. One young man asked the President why the US should maintain its aid budget when there are people at home, such as returning veterans, who are struggling. The Obama/Biden website makes no mention of aid or development. Foreign aid has several elements. One of those elements is defense, is to make sure that we are able to have the defense resources we want in certain places of the world. That probably ought to fall under the Department of Defense budget rather than a foreign aid budget. And finally there’s a portion of our foreign aid that allows us to carry out our activities in the world such as what’s happening in Pakistan where we’re taking – we’re supplying our troops in Afghanistan through Pakistan. But let me tell you: We’re spending more on foreign aid than we ought to be spending. And Congressman Paul asked, is there a place we can cut the budget? Let me tell you where we cut the budget. Discretionary accounts you bring back to 2008 level. We … cut federal employment by at least 10 percent through attrition. And finally, we say to federal employees: You’re not going to make more money than the people in the private sector who are paying for you. We link their compensation. Aid also does not make an appearance on the Romney website as well, but he does devote a sections on Africa and Latin America that emphasize trade. Global demand for Africa’s natural resources will grow. Demographics indicate that by 2050, Africa’s population will double to two billion and one in four workers on the planet will be African. These trends, when coupled with robust economic growth, point to the emergence of stronger economic actors on the world stage and greater partnership opportunities for the United States. While Africa is changing, global competitors like China are taking advantage of these changes and are rapidly outmaneuvering the United States by making strategic inroads throughout the continent and gaining an economic and political advantage over the United States. Bottom Line: Obama has made it clear that he supports foreign aid. Romney has made statements opposing aid, but generally chooses to focus on trade and defense. The lack of inclusion of aid/development on both candidate websites indicates that both do not consider it to be a priority issue. Obama release his FY 2013 budget proposal that includes $51.6 billion in discretionary funding for the State Department and USAID. Representing a 1.6% increase from the FY2012 budget. Romney has made no real proposal with what he would do about the budget, but his new running mate provides some insight into what may come. The Ryan Plan calls for $40.905 billion in discretionary spending for FY2013. A visual representation of the two budgets pulled together by Devex. Bottom Line: Obama wants to maintain aid spending with small growth. Ryan wants to make deep cuts and consolidate/eliminate what he considers to be unnecessary programs and expenditures. That is followed by a modest pace of growth that appears to reflect inflation. Obama’s strategy for Africa that he unveiled back in June places a significant emphasis on trade. The word ‘aid’ makes one appearance in the document and it is proceeded by the phrase “less reliance on.” The plan breaks down into what they call the four pillars of the US strategy towards Africa: (1) strengthen democratic institutions; (2) spur economic growth, trade, and investment; (3) advance peace and security; and (4) promote opportunity and development. Points two and three are heavily focused on the issue of economic growth/development and trade. The document focuses on areas such as improving regional integration, increasing access go global markets and increasing opportunities for women. “It is in the interest of the United States to improve the region’s trade competitiveness, encourage the diversification of exports beyond natural resources, and ensure that the benefits from growth are broad-based. We will pursue the following actions as we seek to accelerate inclusive economic growth, including through trade and investment,” says the report. The Romney website, as seen earlier, makes it clear that trade sits at the forefront. It is most present in his plan for Latin America. In his first 100 days in office, Mitt will launch a vigorous public diplomacy and trade promotion effort in the region — the Campaign for Economic Opportunity in Latin America (CEOLA) — to extol the virtues of democracy and free trade and build on the benefits conferred by the free trade agreements reached with Panama and Colombia, as well as those already in force with Chile, Mexico, Peru, and the members of the Central American Free Trade Agreement…The campaign will also seek to involve both the U.S. and Latin American private sectors in efforts to expand trade throughout the region with initiatives that not only help American companies do business in Latin America, but also help Latin American companies invest and create jobs in the American market. The goal of CEOLA will be to set the stage for eventual membership in the Reagan Economic Zone for nations throughout Latin America and the creation of strong and mutually beneficial economic ties between the region and the United States. Another signal is the recent addition of former World Bank president Robert Zoellick. 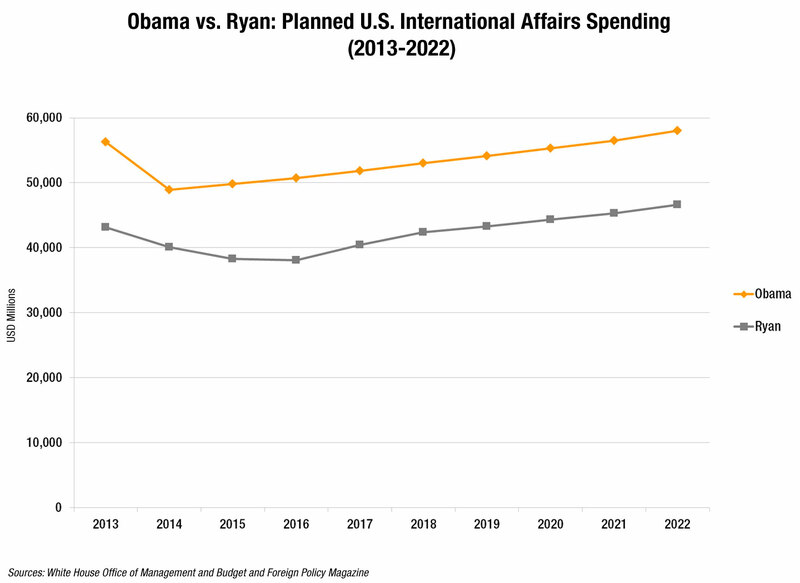 For some it was a bit of a head scratcher, but it may be a stronger indication for how a Romney administration will deal with foreign aid than the Ryan plan. There are even some rumors that Zoellick could fit in quite well as Secretary of State given his previous experiences and connections. Bottom Line – Both sides support trade and make it clear that their aims are to find ways to transform developing economies. Romney seems to lean more heavily on the side of trade over aid, but the difference on this half of the equation seems to be very little. The Obama administration is rather easy to judge in terms of foreign aid. Decisions like placing Clinton in charge of the State Department, the founding of GHI and Feed the Future and recent high level events like Frontiers for Development help fill out a picture that is generally supportive of foreign aid. Romney is trickier. The most information comes from his running mate. While informative, it does not mean that Romney will take to heart every aspect of the Ryan plan. This might be an area where he will push harder than Ryan or soften further. The condemnation of aid came during the primary season when it is more of a pageant to look pretty for fellow conservatives. Presidential debates will get a bit closer to the truth of what a Romney administration might do in regards to foreign aid. There are also two other factors worth considering. First, it is congress who actually sets the budget. The president can make a budget request, but the gritty negotiations take place in the house and the senate. Races for seats in congress will be important as shifts in party numbers can make it easier or harder to cut into foreign aid. Finally, if no agreement is made on budget cuts, the sequestration will be triggered causing across the board cuts. It appears that such cuts are a likely reality given the wrangling in congress. While it is not often considered one of the more important issues during the campaign, the foreign aid budget is yet another place where the two candidates do not appear to see eye to eye.